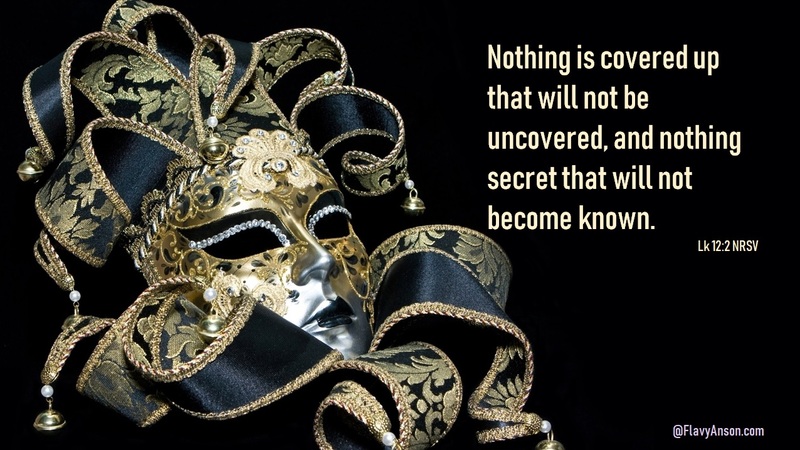 It’s very skilled at being deceptive…it’s veiled in religion…a mask of religion… and its only a certain kind of utterance and power that is going to break through this very strong veil of deception. I see that Lord, so we can’t go in light and fluffy for it’s all disguised in that religious display. So this then is why the demonstration of My power, not with enticing words of man’s speech, is necessary here (1 Cor. 2:4-5), for this mask that has been here knows what to say, knows what to look like on a Sunday, knows how to pretend and is very good at it, but their faith must be established in the power of God. We just surrender now to the Holy Ghost and power, to the One who shows us Your heart and Your will, shows us the sick and diseased, and shows us and penetrates through with the preaching that cuts to the heart, and separates the soul. This utterance must come forth to break through the veil of religion, to break through that deceptiveness that is here…and what Ananias and Sapphira were trying to do, because they saw people doing it so they did it, too. But the anointing and the power and the glory were too great at that time to allow deception. That lie could not walk past the anointing and the one who was walking in the spirit of truth (Peter), for it not to be recognized as a covering and a veil to bring in an impure spirit, a falsehood, and a lie. And what was going on at that time? There was such a great awareness of the truth of Jesus Christ; there was such an anointing and a power in the body. There were miracles going on outside the church walls with the shadow of Peter…there was demonstration and power that was being seen, yes, that was going on. The demonstration of the Spirit of the Lord was upon My people, My ministers, so much so that they didn’t need to be in a building; they just had to walk the streets and there I was moving. Yes, that same power that raised Christ from the dead was upon them and could move even away from them and the shadow, yes, even the shadow, which was My Spirit, was healing and delivering and moving through My apostles at that time. Yes, and even the preaching that came forth was causing hearts to decide, either to disbelieve and oppose, and get angry at the words coming forth, or repent, be glad and rejoice. Can you not see what it looks like? Can you not understand what it looks like when I am moving? There is power and there is an utterance and a word that causes there to always be a dividing, and you said it through your own words and through your own mouth that I either make them glad, sad, or mad. This is evidence of My Spirit moving and My Spirit in dominance and the authority on My ministers of reconciliation. You see it’s almost like He’s highlighted this morning the beginning of Acts where it started, how there was an anointing, how the Holy Spirit first came through a people who prayed and were consecrated and waited on Him, and He came like a whirlwind and the people automatically went out of the upper room and into the streets…that is automatic and that is something you should see and recognize, even in the body today. When the Holy Spirit is poured out people cannot stay in the pew; they have to go out to the streets for there’s an activation. And so you have seen, and so don’t you remember when you went to_________? Aahh, I remember when we were moving in the Spirit at _____________ and how gifts were activated and how some started waking up when the Spirit was released, and yet that leader stopped it because of being in control, and all of a sudden it was all stopped. And what was the release and what happened out of that? It burst, and instead of life, it brought forth adultery in the body and it brought forth coldness and people walking away; it brought forth people being taken away, this marriage being destroyed, this one going off into false doctrine, that one moving away from God and becoming cold and it brought forth a dry cold monument of religion. Whenever someone or something comes to stop (a move of God) that is the result…the work of Satan, the work of death…but oh remember how it all started and how they let the Holy Spirit move and Peter got up and preached, and the word cut to their hearts and there were so many that came to the Lord and believed, and then there was a movement in homes. But understand what tried to come with Ananias and Sapphira was disguised in religion, disguised with a mask of pretension, but because of the sensitivity of the ministers (Peter), they were watching and they saw it as soon as it moved by. There was a discernment that came because the Holy Spirit was in charge and He recognized in the disguise that which was false. But oh how many today would allow Ananias and Sapphira to walk in the door with their pay checks, with their checkbooks, with their debit cards and credit cards, and their bank accounts, and say: “Oh, God told us to give this to you pastor, and oh they would be received and yet it was a messenger of Satan; it was a pride that got in, and then there comes the control through the money…a control of what goes on through the Spirit because of the money. And so I see the disguise that’s gone in and infiltrated the church in this area. It’s a disguise I say. But now me and Bert pray, for we have a little bit of understanding now. You told us to come in demonstration, for how will they even pay attention, how will their faith even be in the words that are spoken, except they first see the power of God—the pure power of God. Thank You for this revelation and understanding and what we’re dealing with in this religious spirit. Honest with God, honest with God…the honesty and unveiling starts with God; it starts with an individual’s relationship with the Lord, it starts with transparency, it starts with an unveiled face, it starts by beholding the glory of the Lord as in a mirror…it starts vertically with every believers’s relationship with the Lord…for you cannot hide from God…you can put a mask on but He sees through the mask. For nothing is veiled but all is open and naked before Him with whom we have to give account and every creature is naked before God. For the sharp sword of His Word cuts through the soul and spirit and the joints and marrow and discerns the thoughts and intents of the heart. You cannot hide from Him! So there is the need to walk before Him in purity and integrity and honesty without defilement and without guile and without hypocrisy and without malice, and as babes in Christ, desiring the sincere milk of the Word so that you may grow thereby. As babes, as babes…for He hides His wisdom from the wise and prudent, but He reveals them unto babes, so as babes, desire the pure milk of the Word. And receive the wisdom, yea, even the hidden secrets of God. I’m reminded that the true apostolic and the true prophetic is in this manner—that it turns the hearts of the people towards God; it turns the motives of the hearts of the people towards God, and that which is veiled and masked is ripped apart, so that they see even as they should see and are known even as they’re known, not even just through a glass darkly, but in the Spirit they see, even as God sees what He desires for them to see at that moment and at that time. So I see where we forget that that operation is supernatural and is such an integral and critical part of the apostolic and the prophetic even as you just said when ___________ ministered at __________, and his opening statements ripped a veil and ripped a mask off the fake and phony carnal prosperity gospel and it turned the motives of people’s hearts immediately toward God, and it put them face to face with God and with pure truth, and then they decide. For too many have spoken smooth words from smooth lips when there’s been war in their hearts. Oh but the truly apostolic and prophetic even as seen in the early apostles and Peter in the early Church, oh, it ripped that mask and that veil and political talk (correctness) right off of people. So I see the Church has had a mask, and many things have been veiled even as You have shown us today, and the great need is for true apostles and prophets to come with strong words and a certain kind of utterance that would penetrate and unmask and unveil those things which are hidden and that are hindering the Church and God’s people and pure truth from seeping through…hindering the true move of the Spirit of God, for the Spirit cannot be yoked with darkness, and what manner of agreement has God with Baal, and how can we dine at the table of God and the table of devils, and what accord has light with darkness? So you see even the need of the hour, even as you’re beginning to write that My house shall no more be called a den of thieves but a house of prayer. So you see that there must be a cleansing and there must be a purification before the true power can really come, for if the power comes without the purification the deception would grow and people would say, “Oh, God is pleased with us for He’s demonstrating His power and pouring out His Spirit and therefore He must be pleased,” and then people would continue to walk on in their blindness and in their deception. For I will not pour out My power on a church that is blemished and full of pride and sin and deception…no, no, no for that would only further add to the deception that already is. So there must be a purification, a purifying, a sanctifying, a cleansing of all the impurities that have been veiled and masked. Our books are forerunners to personal holiness, the move of God, and the return of the Lord. They also combat the departure from the faith and the turning away from the truth we are seeing in our day. If any of our books or articles on this blog are a blessing and encouragement to you please use the social media buttons below to share them.